Winston-Salem, NC, Wednesday, October 11)  Target stores in Winston-Salem and around the country today faced concerned students, mothers, scientists, environmentalists and customers who no longer want to purchase products and packaging made with PVC, commonly known as vinyl, sold by Target. Already Wal-Mart, Nike, Microsoft, Ikea, H&M, and Johnson and Johnson are phasing-out PVC, or polyvinyl chloride, products and/or packaging due to serious health and environmental problems. But Target has not responded to over 60 environmental organizations who have been urging the company since March 2006 to begin replacing these hazardous materials with safe alternatives. In Winston-Salem student activists from the Young Democrats of West Forsyth High School delivered a letter to the manager of the Target Store on Hanes Mall Boulevard and handed out flyers to store customers. 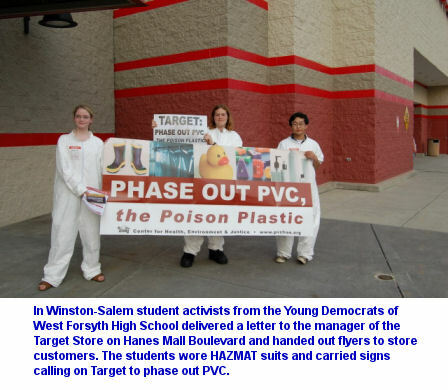 The students wore HAZMAT suits and carried signs calling on Target to phase out PVC. Nearly 30 other Target stores nationwide faced demonstrations today in CA, CT, FL, MA, MD, MI, NC, NJ, NY, OK, OR, TX, VA, and WA. Also today a major Internet campaign was launched at www.pvcfree.org featuring a new spoof video Sam Suds and the Case of PVC, the Poison Plastic made by Webby Award winners, Free Range Studios. This video encourages viewers to take action and sign a petition to Target. So far, there has been no official response from Target. David Mickey, Zero Waste Coordinator for the Blue Ridge Environmental Defense League added, North Carolina already landfills the 11th largest amount of PVC waste in the country. With private companies planning to import waste from other states, we could be moving up the list. The Blue Ridge Environmental Defense League, based in Glendale Springs, is a member of the coalition urging Target to phase out PVC. Products at Target made with PVC include some childrens toys, shower curtains, and packaging, among many others. CHEJ has identified over 100 products sold at Target packaged or made out of PVC. USAGE PROBLEMS: Additives mixed with PVC can leach out of, or volatize from, a PVC product. An EPA study found one new vinyl shower curtain can lead to elevated levels of indoor air toxics for over one month. Our bodies are contaminated with poisonous chemicals released during the PVC lifecycle such as mercury, dioxins and phthalates, which may pose irreversible lifelong health threats. RECYCLING PROBLEMS: When PVC products are mixed in with recycling of non-chlorinated plastics, such as in bottle recycling programs, they contaminate the entire recycling process. In fact just one PVC bottle can contaminate a recycling load of 100,000 soda bottles. DISPOSAL PROBLEMS: As much as 7 billion pounds of PVC are discarded every year in the U.S. Dumping of PVC in landfills poses long-term problems from leaching of toxic additives into the groundwater, dioxin-forming landfill fires and toxic landfill gases. When produced or burned PVC plastic forms dioxins, a highly toxic group of chemicals that build up in the food chain. The U.S. EPA classified the most potent of the dioxins as a human carcinogen. Dioxins are also associated with altered sexual development, reproductive problems, diabetes and organ toxicity. REPLACE PVC WITH SAFE ALTERNATIVES: Adidas, Bath & Body Works, the Body Shop, Crabtree & Evelyn, Firestone Building Products Company, Gerber, Honda, HP, Ikea, Johnson & Johnson, Kaiser Permanente, Lego Systems, Microsoft, Nike, Samsung, Shaw Industries, Toyota, Volkswagen, Volvo, and Wal-Mart are among the many companies who are phasing out PVC in products and/or packaging. Safer alternatives are widely available and effective for virtually all major uses in building materials, medical products, packaging, office supplies, toys and consumer goods. DONT BUY PRODUCTS MADE OF PVC: Products made out of PVC are often referred to as vinyl. Remember, bad news comes in threes. One way to be sure if packaging is made from PVC is to look for the number 3 inside, or the letter V underneath, the universal recycling symbol. CHANGE POLICIES: Policy makers at the local, state and federal levels should enact and implement laws that steadily phase out the production, use, and disposal of PVC and lead to a complete phase-out and just transition of PVC. ATTN JOURNALISTS: The Sam Suds video plus background materials on PVC hazards and Target correspondence is available by visiting www.pvcfree.org B-Roll is also available for TV Reporters.